The editors of a scientific journal have an editorial prerogative to publish articles that fall under the editorial scope of the journal as they see it. But defining this scope in a way that is clear to those outside the editorial team can be difficult and any definition can become dated as science and the journal evolve. Here we discuss the scope of Nature Methods. As stated in our Guide to Authors, Nature Methods publishes “novel methods and significant improvements to tried-and-tested basic research techniques in the life sciences.” We broadly define “research techniques” as methodological procedures, biological or synthetic reagents, computational algorithms, software tools, instrumentation and other technologies. The phrase “basic research” in the sentence above is key and, as explained in April’s Editorial, methods intended for later stage research applied to the clinic, drug discovery or industrial processes are generally considered outside our scope. These applications are often classified as biotechnology and thus are probably more appropriate for Nature Biotechnology or, if clinically oriented, a Technical Report in Nature Medicine. But as April’s Editorial acknowledges, method and tool developments can be relevant for both basic research and more ‘downstream’ applications. This requires us to be continuously walking an editorial tightrope between them. As circumstances change and fields develop we may need to adjust how we apply our editorial scope. As also stated in our Guide to Authors, Nature Methods is targeted at “academic and industry researchers actively involved in laboratory practice.” The phrase “laboratory practice” is intended to indicate that the journal generally only publishes methods for work that occurs in a research laboratory environment. On occasion, we may consider compelling work that doesn’t fall under the typical definition of laboratory research, particularly in areas like ecology where the basic research environment extends beyond the confines of a brick and mortar lab. 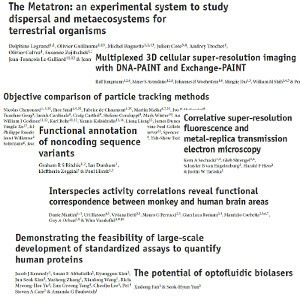 An example was our publication of The Metatron: an experimental system to study dispersal and metaecosystems for terrestrial organisms. We are constantly reassessing our editorial scope and can work with authors to adapt the presentation of work that might otherwise be considered out of scope if we feel it is sufficiently compelling, relevant to our readership and can be appropriately presented as important for basic research. We are happy to respond to presubmission inquiries submitted via our manuscript submission system asking about the appropriateness of the scope of a proposed manuscript. But if a manuscript is already written please submit the full manuscript as a regular submission and don’t worry about formatting it to fit Nature Methods’ article style. This will allow us to make a more informed decision and format can be dealt with later in the event we proceed towards publication. If a manuscript is clearly out of scope we will endeavor to provide a fast decision. Finally, if there is an area of basic biological research that you feel is underrepresented in Nature Methods but should be of substantial interest to our readership, please let us know. For example, we published virtually no computational methods for the first several years of the journal but they now represent a substantial fraction of our articles. As we strive to serve our readers we want to avoid falling into a pattern of publishing research limited to a few areas, but our success in doing this depends heavily on receiving submissions from a broad range of research areas and we encourage the wider basic research community to consider Nature Methods even if we haven’t yet published much, or anything in a particular area.